Photos: Rob Wheeler, instrument courtesy of Randy Anderson. 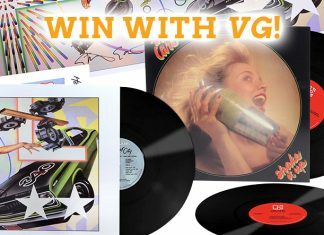 Founded in the early 1980s by Hans-Peter Wilfer, Warwick has a familial connection to another well-known German brand from a time when that nation was divided following World War II. Wilfer’s father, Fred, founded Framus in 1946, and Hans-Peter worked at the company’s facility before it closed in the ’70s. His desire to build stringed instruments remained strong, however, and he started Warwick in September of ’ 82. As production increased, Warwick began making basses that looked more conventional even as it integrated non-standard woods known for their hard/dense qualities. Wilfer’s reasons were more about being practical than eccentric. One of Warwick’s enduring models is the Thumb Bass, introduced in 1985 as the JD Thumb Bass – the “JD” designation in reference to expatriate American bassist John Davis, who impressed Wilfer with his popping, funk-based style utilizing the stubbiest digit on his right hand. “The Thumb Bass was designed specifically for comfort in slapping and playing in a virtuosic way, and it was the first bass with such a small body,” said Wilfer. The bubinga of the Thumb Bass’ body, highlighted by its oil-and-beeswax finish on the unique upper-cutaway horn. Its aesthetic was derived from training as an illustrator and having a mother who was a sculptor. “I probably inherited my taste for design from my mom,” he said. 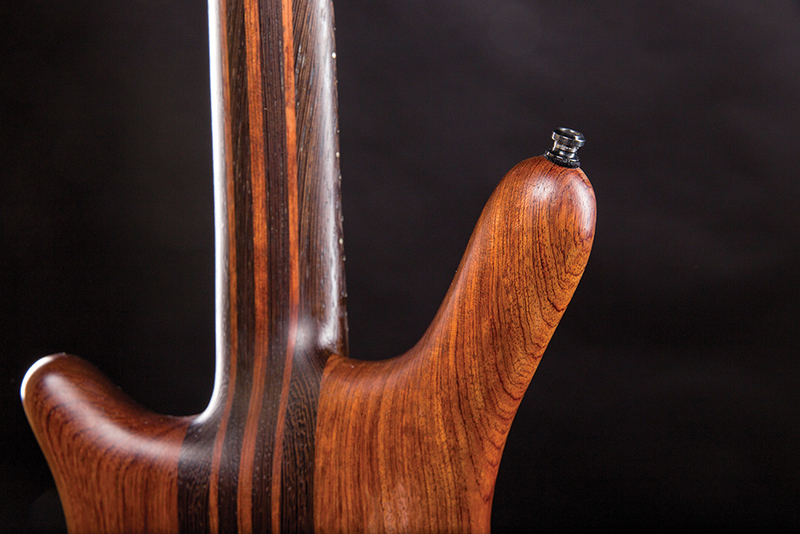 The Thumb Bass’ finish highlights its seven-ply bubinga/wenge neck. 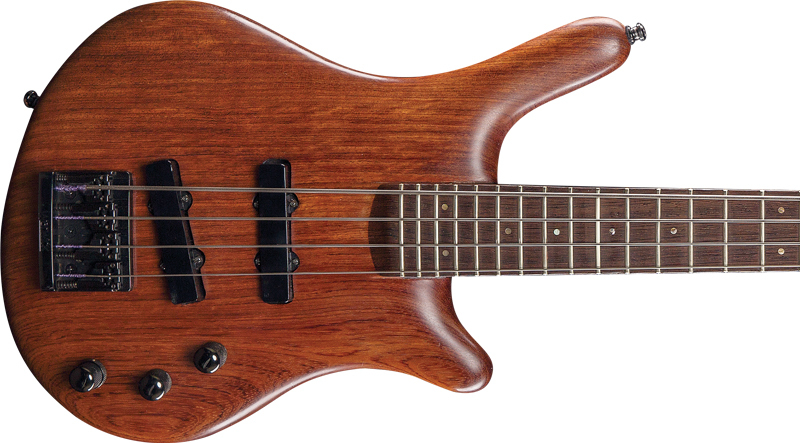 The Thumb Bass shown here is a 1986 example of the original configuration, conforming to the earliest construction and finish methods including a proprietary “hidden neck-through” design with a seven-layer laminate neck made of alternating wenge and bubinga assembled such that it doesn’t look like a neck-through; its body has a cap composed of three sections – two wings and a plank that covers the neck where it courses the body – cut from one piece of wood and installed to look contiguous. “The process is complicated and involves measurements of hundredths of millimeters,” said Wilfer. The approach also allows use of 26 frets (made of bell bronze on this instrument) on a 34″ scale, giving the player what Wilfer called “…more virtuosity.” The fretboard is wenge, and the body has an oil-and-beeswax finish typical of Warwicks in that era, as is its brass Just-A-Nut design. Other hardware includes tuners, bridge/tailpiece, and locking strap buttons made by Schaller. The bridge is Wilfer’s design, and exclusive to Warwick in that era. The angled tuners, meanwhile, “…have to do with the angle of your hands; it’s more natural to turn them in that way,” he said. The treble pickup was angled to get a better response from the D and G strings, and controls are appropriate – nearest the pickups is a master Volume with push/pull for active or passive mode. The middle knob controls a pickup-pan potentiometer with center detent, while the concentric knob closest to the bridge offers tone control (lower bass, upper treble). The Thumb remains a key model for Warwick, but has undergone changes including separate bridge and tailpiece and a body with shorter upper-cutaway horn. It’s offered in four- and five-string variations, and there’s a bolt-neck option. 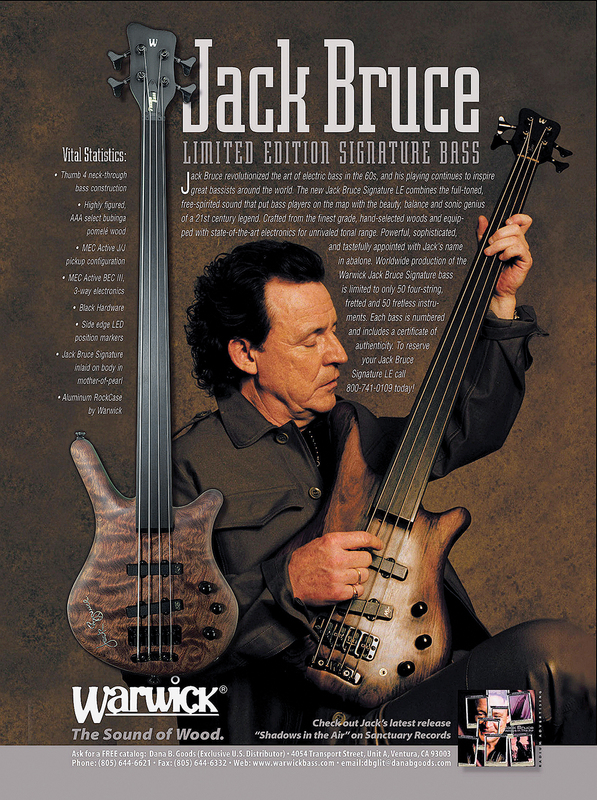 A circa-2001 ad for the Jack Bruce limited-edition signature bass. 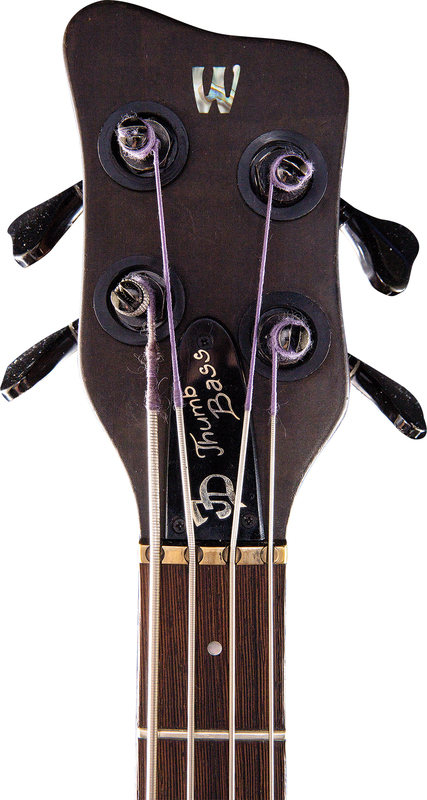 Features of early Thumb Bass models include the brass Just-A-Nut and the enduring angled tuners. Jack Bruce (1943-2014) was an early endorser and the company made two signature models with him. The first was a limited four-string Thumb Bass variant, while the latter was aesthetically reminiscent of his ’60s Gibson EB-3. Warwick ultimately outgrew its Bavarian facility and in 1995 relocated to Markneukirchen, in Saxony. Today, Wilfer takes pride in having made his company one of the industry’s most eco-friendly manufacturers, and its overall success has helped him crank up the Framus brand again in a separate venture that has remained in family ownership. “I love my work as much as I did on the first day,” he said. “My wonderful wife, Florence, helps. My daughter, Estelle, works in graphics, and my son, Nicholas, is learning to be a guitar builder.